Location of asteroid 2003 SD220 at 5:00 am ACDST on Christmas morning as seen from Adelaide Australia, just after it's closest approach. Click to embiggen. 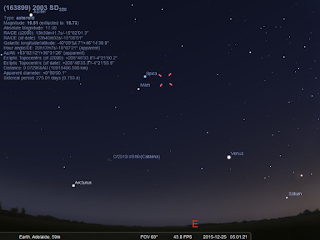 The Earth and Moon as seen from 2003 SD220 as simulated in stellarium. Asteroid 2003 SD220, also known as the Christmas eve asteroid, will come close to Earth on 13:08 UT 24 December (that is 00:08 am AEDST in Australia) at distance of 0.073 AU. Visible only in high powered telescopes at closest approach, it has gained unwarranted attention from breathless articles in the tabloid press claiming that it could cause earthquakes (it won't, just like the other asteroids didn't). Various fringe sites have suggested it is, or is linked to, an imaginary planet called Nibiru (it''s not). To put this in perspective, at its closest 2003 SD220 is around 28.4 Earth-Moon distances away this time. Yes, that is over 28 times the distance from the Earth to Moon (recall that the Apollo missions took 3 days to get to the Moon). 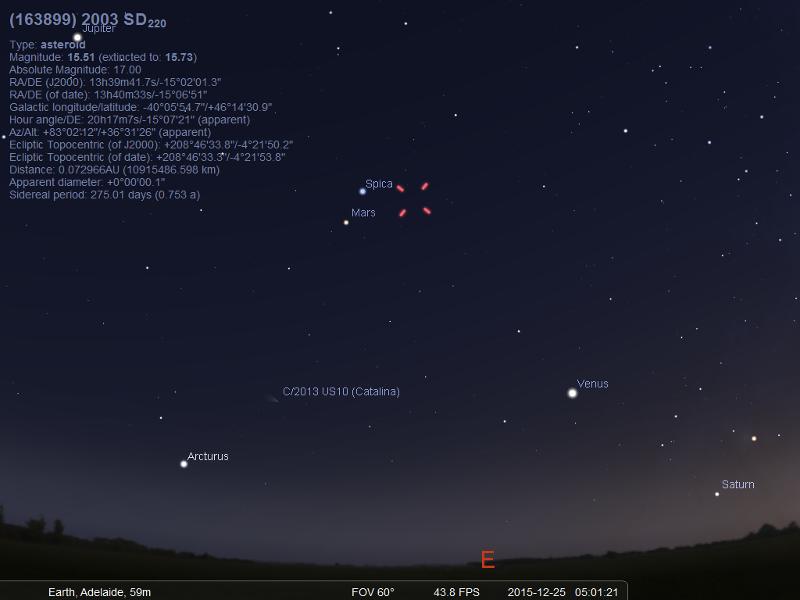 As you can see from the image above, 2003 SD220 will only see the Earth and Moon as faint dots. 2003 SD220 is 1.8 kilometers in diameter (actually, it is quite elongated, image credit), too small and too far to have any gravitational effect on Earth. Consider that the Moon, orders of magnitude larger and 28 times closer, has negligible effects on earthqukaes, a 1.8 km dust mote is not going to have any effect. The asteroid comes close to us every couple of years or so, and hasn't had any effect in all the years it has passed us by. As well, other large asteroids are being ignored favour of 2003 SD220. 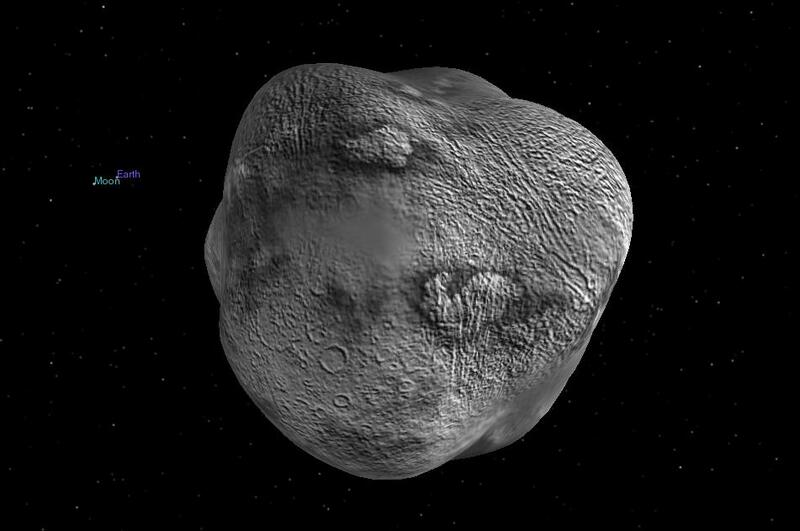 What about 2008 CM, a 1.5 km wide asteroid that will pass us by at 22 Earth-Moon distances on December 29. No one is claiming IT will cause earthquakes of is Nibiru. So bottom line, 2003 SD220 will pass us by harmlessly, like all the other large asteroids we have been following. 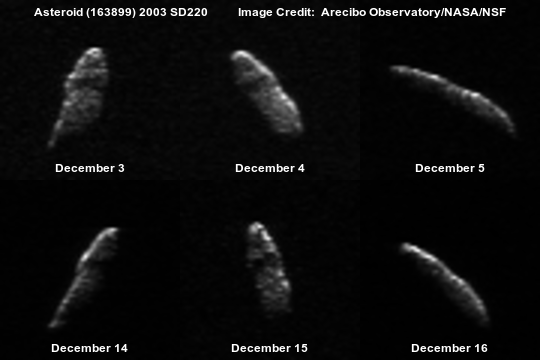 For those of uswho just want to play around with the asteroid orbit, or who want to argue with people who claim this asteroid will hit us (it won't) I've made Celestia files for 2003 SD220. As usual, copy the data here to a plain text file (2003SD220.ssc) and copy the file to the Celestia extras folder. #From 217 observations at 8 oppositions, 2000-2015, mean residual 0".46. Question: If this were to strike, is there any way to tell approximately WHERE on earth it woul hit (land/ocean/continent)? Just curious. Watch Beverly Hoodz Presents - There Is No Such Thing As Santa Claus ..! !